When a disciple of Jesus takes his or her baptismal call seriously, that person’s words and actions live on long after he or she leaves this world. An outstanding example of this truth is found in the prophetic discipleship of the Rev. Martin Luther King, Jr.
Dr King, with selfless courage, faithfully lived out his God-given mission 50 years ago – albeit ending tragically too short. What Happened 50 Years Ago? For on the evening of April 4, 1968, after preaching and being present in solidarity with poorly paid African-American sanitation workers, King, while standing on the balcony of the Lorraine Motel in Memphis, Tenn., suffered a fatal bullet wound – leaving this world at the young age of 39. On that sad day America, and indeed the whole world, lost a powerfully prophetic voice and courageous witness to the social justice and nonviolent peace teachings of Jesus Christ. But a fatal bullet coming from one assassin or from a conspiracy of Mafia, local, state and federal government agencies could not silence the truthful words that continue to challenge a nation and world to completely abandon its deep-seated acceptance and addiction to racism, inequality, injustice, militarism and violence. The messenger was killed. But his message lives on! For example, there is indeed enough food in the world to adequately feed every single child, woman and man. And yet, over 40 million people in the United States struggle with hunger. And according to Catholic Relief Services over 800 million fellow human beings throughout the world are hungry. Why are we allowing this to happen? In large part this hunger suffered by so many is due to an increasing disparity between the haves and the have-nots. And President Trump’s and Congress’ new tax law widens this disparity. And while most Americans think the U.S. gives at least 25 percent of its national budget to help the poorest hungriest people in the world, the truth is that the U.S. government allocates less than 1 percent towards poverty-focused international aid. That is downright stingy. 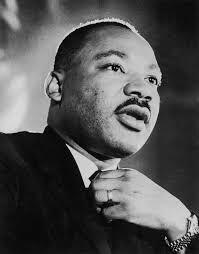 King said, “A riot is the language of the unheard.” This is a hard fact. And it applies not only in the U.S. but around the world. I recently heard Rev. Mae Cannon, executive director of Churches for Middle East Peace, say in reference to the injustices and poverty suffered by Gazans at the hands of the Israeli government that “desperate situations leave people feeling desperate. And desperate people lead to war”. Spiritual death draws ever closer as the U.S. and many other nations continue to spend $1.7 trillion annually on war and war preparation while allowing countless people to suffer and die in poverty and hunger. And that is where the U.S. and many other nations are at: the cliff of spiritual doom. America has “In God we trust” on its money, but in many ways not in its heart.